Annular Cutters | HSS, Armor Plated, Tungsten Carbide | Advance Drills Inc.
* HSS Cutters must be used with lubricant. 3/4″ for cutters up to 3″ dia. 1-1/4″ for cutters 3-1/16″ to 5-1/8″ dia. 7-3-402 2-piece pin for 3″ and 4″ depth cutters with 8mm pilot hole. ** We also stock 4″ depth HSS cutters and Metric HSS cutters. Larger diameters and special sizes available upon request. Please contact us for pricing and delivery. * Cutters with 3″ depth have an 8mm dia. pilot hole. Shank size: 3/4″ up to 3″ dia. ** Metric and 3″+ diameter cutters available upon request. Please contact us for pricing and delivery. 1-1/4″ for cutters 3-1/16 to 5-1/8″ dia. ** We also stock Metric Carbide cutters. Please contact us for pricing and delivery. Larger diameters and special sizes are available upon request. At Advance Drills, we carry top quality annular cutters such as; HSS, Armor Plated, and TCT Hornet, that set the standard for drills in our industry. These cutters are perfect for heavy-duty use on-site or in the shop. One of the advantages of our annular cutters is the improved efficiency during the hole-creation process compared to the traditional method used by twist drills. When you’re using one of our cutters there are multiple teeth that cut into the material around the periphery of the hole which forms a solid metal slug. Therefore, no matter what size hole you’re cutting, there will only be a small amount of material around the edge of the hole that will be removed. Since our cutters have multiple teeth they remain sharper, longer, and create 5 to 10 times more holes than your average twist drill. You will see that your final hole comes out smooth, burr-free, and requires no reaming. In addition, our annular cutters simplify the hole making process down to an easy 3 steps. First, the pilot pin accurately centers the cutter over the area to be drilled. Secondly, during the actual drilling, the pilot pin retracts and allows the internal lubrication to reach the cutting teeth. Lastly, when the hole is done, the metal slug is automatically ejected from the cutter leaving a smooth and polished finish. Another unique feature of our annular cutters is their tapered inner wall. This design accommodates for the effect of frictional heat, which can allow for the expansion of both the cutter and the slug. It also makes the ejection of the slug easier. 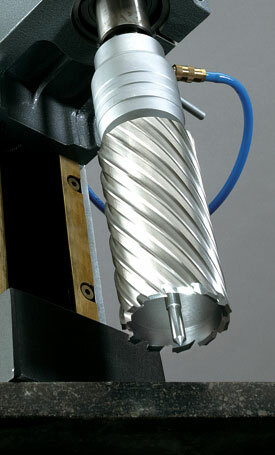 Compared to twist drills, our annular cutters cut at higher feed rates with lowered horsepower consumption. This allows you to run on smaller machines and drill 3 to 4 times faster. For example, holes that were made from heavy and bulky 70 to 80 pounds twist drill machines can now be made on smaller portable machines that only weigh 24 pounds. Furthermore, there is a wide variety of portable custom drills in our industry that exist, so whether you’re drilling holes on site, repairs, or construction on structural steel, we got you covered. These new lightweight machines can also be used in the manufacturing or fabrication shops and be configured in both horizontal and vertical positions. One final benefit a lot of people don’t realize about annular cutters is after the drilling process is complete, it’s a lot easier to clean up and recycle. The scrap from annular cutters consists of a minimal amount of swarf and the solid slug that gets ejected, allowing you to separate the pieces for environmental purposes. Plus sorting a solid chunk of metal is quicker, which means you can get more money when you sell back the scrap. For any of your annular cutter needs, Advance Drills will make sure we provide you with the best tools you need to get the job done as quick and efficient as possible with the highest quality in products and service.